Handcrafted Timber Frames for Generations to Come! The year carved into an eastern white pine beam. The carved beam is centrally located in a custom designed gambrel frame home in Lafayette, NY. The front entry and porch for a custom timber frame home. This custom frame sits atop a hillside with a view of the valley south of Syracuse, New York. This fishing cabin is located along the Salmon River in Northern New York. The custom frame was built with hemlock timbers and features a principle rafter and purlin roof system. The masonry heater pictured provides enough heat to warm this custom timber frame home for the cold Central New York winters. The frame features hardwood timbers harvested from the owners' woodlot. Located in Central New York, this larch timber frame porch creates a beautiful transition from interior gambrel timber frame to outdoor patio and waterfall. 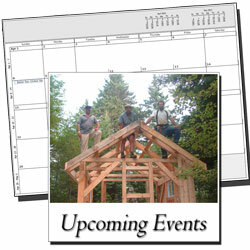 New Heritage Woodworking is committed to the tradition and craft of timber framing. 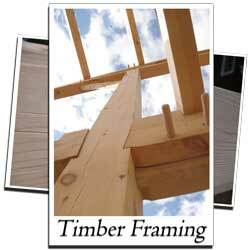 We strive to provide our customers with the highest quality timber frames and services. Traditional handcrafted timber frames have stood the test of time and we take great pride in continuing that tradition with the utmost attention to detail in every project we undertake. Whether you are looking for a pre-designed timber frame package for a get-away cabin, garden pergola, custom entrance, traditional barn, or a custom designed dream home, we are equipped to deliver your handcrafted timber frame to suit your individual needs. 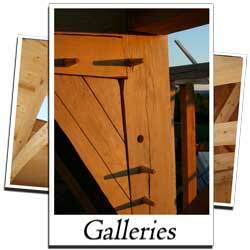 Interested in a custom designed timber frame entrance, barn, or dream home? We can get your streamlined project delivery started as soon as you contact us. Our three dimensional design process will help you visualize the final project long before we start to cut the joinery. We utilize a single person project delivery method so that your custom timber frame project focuses on your needs. This means that the wishes and concerns you express during your initial meeting are considered and addressed during all design, fabrication and installation phases. Let us share our passion for timber framing with you by contacting us today so we can make your dream a reality.